Looking for a cheesecake replacement with a few more omega 3 fatty acids and extra fibre? 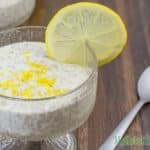 Our Low Carb Blended Chia Cheesecake Pudding is the perfect sweet treat. In a mixing bowl, add the chia seeds and natvia and mix. Add the lemon juice, vanilla, cream and water and stir well, ensuring the break up any lumps. Cover the bowl and place in the fridge for at least 6 hours, to allow the chia seeds to soak up the liquid. We leave ours overnight for best results. Remove the mixture from the fridge and stir well. Pour it into your blender along with the softened cream cheese, water and lemon zest. Blend on high speed for 5 minutes, until the pudding is thick and creamy. Spoon into 4 serving dishes and enjoy.